Since 2012, USA’s Ashton Eaton has won all four major championships he has started. The 27-year-old hasn’t completed a decathlon in more than two years, but he is still the overwhelming favourite in Beijing. Eaton won the 2012 world indoor title, the 2012 Olympic gold, the 2013 world crown and 2014 world indoor title. The 27-year-old had some weak events in his Moscow series in 2013, and his recent results suggest that he should be able to score a higher total than the 8809 points he achieved two years ago. A wind-aided 10.20 in the 100m, a 45.55 personal best in the 400m, a 13.38 season’s best in the 110m hurdles and, more recently, a 5.40m personal best in the pole vault are clear indications of what Eaton will be capable of in Beijing. Eaton needs his form to be good, because countryman Trey Hardee is closing in fast. The 31-year-old, who was the world champion in 2009 and 2011, scored a world-leading 8725 to win the US Championships. It was his second-best score ever, only behind the 8790 he scored to win in Berlin in 2009. The Olympic silver medallist did not finish the decathlon in Moscow two years ago after failing to clear a height in the high jump. The third medal favourite is as clear as the first two. 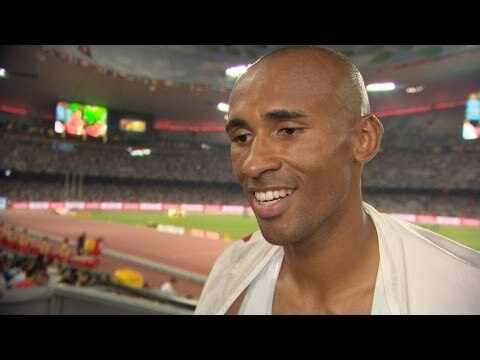 Damian Warner took the bronze in Moscow in 2013 and in July he won the Pan American Games with a Canadian record of 8659. The 25-year-old has recorded some excellent results in individual events this season with PBs of 10.28 in the 100m and 13.27 in the 110m hurdles. Behind the top trio, France’s European silver medallist Kevin Mayer, who finished fourth in Moscow, is unable to start due to an injury. The 23-year-old scored 8469 earlier this year for third place on the 2015 world list. Athletes looking for an outside chance for a medal include the strong German contingent of Kai Kazmirek, who won in Gotzis with 8462, world silver medallist Michael Schrader, who won in Ratingen with 8419, and Rico Freimuth. Willem Coertzen finished ninth in Moscow, but is looking for a considerably better finish in Beijing. The 32-year-old South African set an African record of 8398 for third place in Gotzis in May. Russia’s European indoor champion Ilya Shkurenev is also in the picture with an 8378 season’s best, set when winning the European Cup in Aubagne. The 24-year-old was eighth in Moscow in 2013 and took the bronze medal at the 2014 European Championships. Dutchman Eelco Sintnicolaas, who finished fifth in Moscow, has scored 8298 this season and always comes through strong on the second day.